After adamantly rejecting all attempted negotiations, the Honduran de facto government signed an agreement on October 29th ostensibly opening space for a potential resolution to the country’s four-month standoff. The agreement called for the formation of a unity government that will assume power and oversee the November 29th presidential elections. But even under the most favorable of circumstances, the terms of the peace agreement would transform Zelaya into little more than a figurehead president, drained of all his authority. The accord left the restoration of executive power in the hands of the Honduran Congress and Supreme Court, the two bodies that authorized and led the way to Zelaya’s removal from the presidency in the first place. Still, the most lethal blow to Zelaya’s return was delivered by Secretary of State Hillary Clinton when she acknowledged that his restitution would not affect Washington’s recognition of the elections. Apparently the U.S. plan under discussion was never meant to be implemented, and de facto leader Roberto Micheletti’s alleged agreement was probably little more than a hoax. While the new deal was feted as ending the conflict, such celebration may have proved to be premature as progress has since reached a standstill, which perhaps was the intended outcome all along. On Tuesday, Honduran Congressional leaders postponed calling the legislative body out of recess in order to verify the accords, and it remains to be seen whether they will even bother to endorse the agreement, especially after the State Department so effectively sabotaged the peace process. Ubiquitously reported as guaranteeing Zelaya’s reinstatement as President, competing claims by both Zelaya and Micheletti over who will have the right to lead the unity government have led to further confusion and indecision. The two sides were granted until Thursday to agree upon its composition, but as of Friday morning no agreement had been reached. Some late-breaking reports go so far as to say that the negotiations have failed. Micheletti’s announcement that he was moving to form a unity government in the absence of representatives from Zelaya’s camp, whose presence was withheld pending his reinstatement as president, has further confirmed these reports. The perceived breakthrough was achieved primarily by the long overdue application of U.S. pressure on the de facto government. Mediation efforts were left in the hands of the Organization of American States (OAS) and Latin American leaders while the U.S. vacillated and the Obama administration refused to take a lead in negotiations. Washington had, after all, asserted at the time that it did not want to dominate the issue, a claim that Latin American intellectuals echoed. But what the region really wanted was an act of primus inter pares, which they discovered would come only at a heavy price. So after this period of quiescence, Washington apparently relented and dispatched a team of envoys to Tegucigalpa on October 28th. Led by outgoing Assistant Secretary of State for Western Hemisphere Affairs Thomas Shannon, Special Assistant for Western Hemisphere Affairs Dan Restrepo, and Principal Deputy Assistant Secretary for Western Hemisphere Affairs Craig Kelly, the delegation met separately with both Zelaya and Micheletti, taking a mere two days to reach a purported resolution. But like Costa Rican President Oscar Arias’ San Jose Accords, the new U.S.-brokered agreement has come under fire from critics over claims that inviting Micheletti to the bargaining table as an equal only further solidifies his position as a legitimate actor with a political status commensurate to that of Zelaya. Since the day of the coup, the OAS and Latin American heads of state have doughtily insisted that the results of the November elections would not be recognized without Zelaya’s prior restitution. While the U.S. has threatened not to recognize the election, some commentators began to express doubts about the bona fides of such assertions. Suspicions were confirmed when, in an interview with CNN en Español, Shannon claimed that the U.S. will recognize the upcoming elections with or without Zelaya’s return. This unsettling point may come to be viewed as the crucial moment when Washington’s true intentions became apparent. Senator Jim DeMint (R-SC), who placed a hold on Obama’s nomination of Arturo Valenzuela as Assistant Secretary of State for Western Hemisphere Affairs over the Obama administration’s handling of the crisis, claims that Secretary of State Clinton confirmed Shannon’s remarks in a phone call, allowing him to release the hold, which had removed Valenzuela from the front lines. The State Department’s lack of fidelity to restoring the constitutionally elected Zelaya provides a clear glimpse into the U.S.’s commitment (or lack thereof) to democracy in the region. The U.S. has, until now, played a particularly tepid role in resolving the crisis. While the OAS and nearly all Latin American states condemned the coup in the harshest of terms and called for Zelaya’s unconditional return, the Obama administration did neither for weeks, conducting itself in a depressingly desultory manner. In a particularly egregious public remark, Secretary of State Clinton described Zelaya’s attempted July return from his forced exile as “reckless,” rather than praising him for having the guts to dare to retake his presidency. Eventually, the U.S. aligned itself with the rest of the region, denounced the coup, canceled visas of Honduran leaders, and suspended a small portion of aid to Honduras, which later grew to a larger figure. However, it failed to utilize its unrivaled hemispheric clout to exert pressure in a timely and consistent fashion on the de facto government, which still continues to receive millions of dollars in non-humanitarian aid from Western sources. Such foot-dragging by the U.S. has prevented the region from putting down the coup with the decisive response it deserves. Much more remains to be done to mitigate the damage being dealt to Honduran society by the de facto regime. Human rights abuses continue unabated as the opposition is routinely intimidated and beaten by a repressive state apparatus, led by the notorious former Battalion 3-16 commander, Billy Joya, disgracefully enough now Micheletti’s security advisor. A state of exception was declared from September 28th to October 19th that suspended five constitutional rights, including habeas corpus, freedoms of the press, association, circulation, and freedom from unwarranted search and arrest. 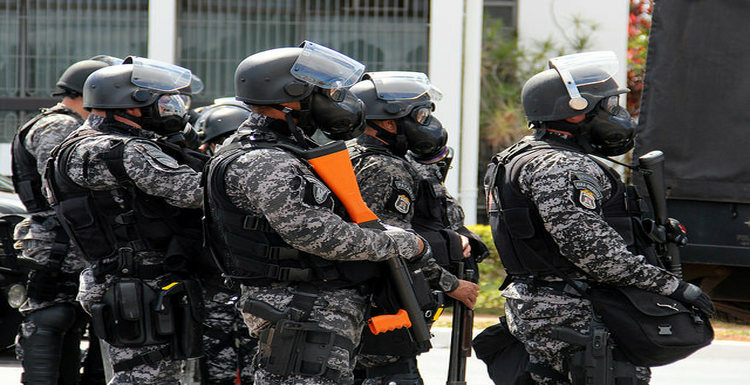 It was only lifted after U.S. and worldwide outrage condemned the de facto government for violating the Honduran Constitution. Today, Zelaya remains holed-up in the Brazilian embassy and he has accused the de facto government of using hydrogen cyanide gas and sound cannons to unnerve his supporters and Brazilian hosts. Eleven citizens have already lost their lives and a resolution to the Honduran conflict is long past due. If the latest round of negotiations fail, as all indicators at this time suggest, it will be a significant step back for the Obama administration’s relationship with Latin America. The failures in Honduras are a further indication that rather than presenting a bold, new, and enlightened policy in Latin America, Clinton and Obama’s conduct in dealing with the region has projected a shocking willingness to travel along the same discredited diplomatic ruts of the Bush administration. In fact, the U.S. has a responsibility to the Honduran people to use whatever means necessary to reestablish a legitimate government and assure that the ouster of a democratically-elected president will not be accepted nor tolerated under any circumstances.